.An open Internet is good for society and good for business. And American technology companies need to make a “principled stand” against attempts at censorship. 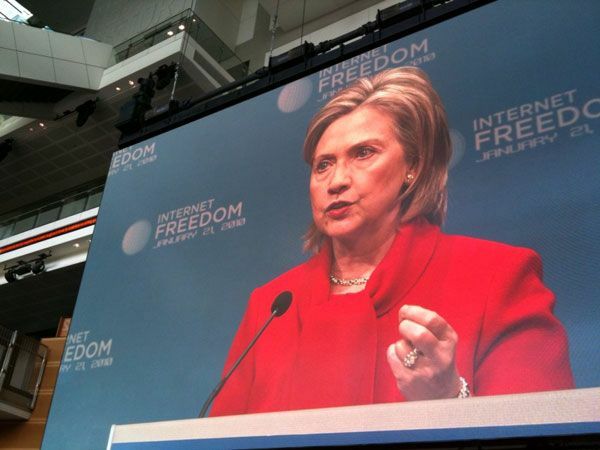 That’s one of the messages delivered today by U.S. Secretary of State Hilary Rodham Clinton in a major speech that focused on attempts by some national governments to stifle the “free exchange of ideas” among their citizens. .Coming only a week after Google announced that it had been the victim of cyber attacks aimed at gaining access to the email accounts of Chinese human rights activists, Mrs. Clinton called on Chinese authorities to “to conduct a thorough investigation” of the attacks and report “transparent” results. She also issued a direct challenge to information and technology companies doing business in countries where governments seek to censor Internet communication. We feel strongly that principles like information freedom aren’t just good policy, not just somehow connected to our national values, but they are universal and they’re also good for business. Mrs. Clinton said she was also encouraged by the work of the Global Network Initiative, a voluntary effort by technology companies “who are working with non-governmental organization, academic experts, and social investment funds to respond to government requests for censorship.” Google, Microsoft and Yahoo! are among the few U.S. technology companies that have agreed to the principles of the Global Network Initiative. Disclosure: Business Ethics Editor and Publisher Michael Connor is also Executive Director of the Open Media and Information Companies Initiative (www.openmic.org), a non-profit media advocacy organization that regularly addresses issues related to an open Internet and corporate responsibility.